Most of our clients come from word-of-mouth referrals. Please tell all of your friends! There are many students out there that could greatly benefit from our service. 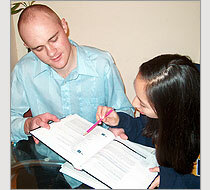 If you refer a friend to us, we will give you one free hour of tutoring. That’s a value of $80 FREE for each friend you recruit! Please have your friends call or email – and ask them to mention your name as the referral. • No long term commitments. • Our tutors come to you.